James Gillett grew up and attended elementary and high school in Sparta, Wisconsin. He began the study of law in December of 1878 and was admitted to the Wisconsin bar in 1881. Gillett arrived in Eureka in early 1884, where he opened a successful law practice. Gillett’s first wife, Adelaide Pratt, died in 1896 leaving him with three young children. In 1898, he married Isabella Erzgarber, a popular socialite from San Francisco. He began his political career as the Eureka City Attorney, an office he held until 1896 when he was elected to the state senate. 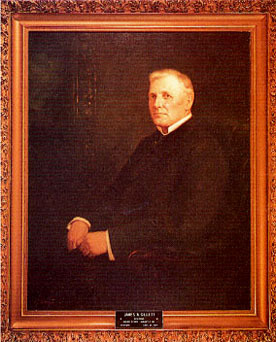 Gillett briefly returned to the practice of law until 1902 when he was elected to the House of Representatives. Gillett won the Republican Party nomination for Governor over incumbent George Pardee, whose refusal to side with the railroad monopoly in his political decisions had soured the party against him. During his term as Governor, automobiles were becoming more and more common in California; Gillett pioneered the state highway system. He also worked to develop parole guidelines that would help prisoners reform themselves and return as productive members of society. Like many other governors, Gillett suffered financially while in office; therefore, he felt compelled to return to private practice after only one term. It is thought that his wife Isabella was influential in this decision. Use the California State Library’s interactive tool to view Executive Orders and Proclamations signed by Governor Gillett.